Joe Vasicek’s first experience with science fiction was watching Star Wars as a child. He discovered the sci-fi & fantasy section of the library shortly thereafter and hasn’t looked back since. He first came onto the indie publishing scene in 2011 with his debut novel Genesis Earth. Since then, he has written more than twenty novels and novellas, including Bringing Stella Home, Desert Stars, Heart of the Nebula, and the Star Wanderers and Sons of the Starfarers series. His major influences include Orson Scott Card, Ursula K. Le Guin, Lois McMaster Bujold, and David Gemmell. 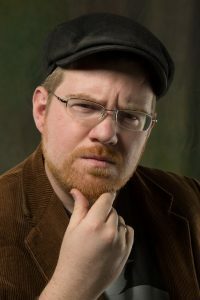 He attended Brigham Young University, where he took Brandon Sanderson’s writing class and won first and second place in the Mayhew short story awards. His writing has been published in Leading Edge, BYU’s student-run SF&F magazine. He also keeps a regular writing blog at One Thousand and One Parsecs. As a young man, he studied Arabic and traveled across the Middle East and the Caucasus. He has also criss-crossed the United States, and has lived in Texas, Illinois, Massachusetts, California, and Washington DC. He currently lives in Utah, which he claims as his home. Wherever he goes and whatever he does, though, he’s always writing. Orson Scott Card once said that everyone comes across a thousand good story ideas a day, and that a skilled writer will recognize three or four of them. I’ve definitely found that to be the case. My story ideas come from the strangest of places, but most of them just accumulate from noticing weird anacronisms in everyday life. I am definitely a pantser, though I always know the ending before I start. I usually keep a rought outline of what I’ve written in a text file, so that I can keep things straight. To the extent that I do outline, it’s no more than a chapter or two ahead. Hugh Howey is right: story is king and prose is pawn. Writing groups are useful for learning the basics of craft, but not the best for fixing stories. Sometimes, the best beta readers are non-writers. Don’t take anyone’s advice as the gospel. The single best and worst writing advice I ever read came from the same source. Never get so caught up in an echo chamber that it shapes your entire perspective on a subject. I have never found an online community, writing or otherwise, that was not an echo chamber. If you want to make a living as a writer, I have only three words: marketing, marketing, marketing! (But writing is also marketing). My goal has always been to make a living as a writer, and indie publishing was clearly the best path for making that possible. As a self-published writer, I have no one else to blame for my failures, but my successes are all my own. There is no form of storytelling as timeless as the novel. It has endured through countless economic and social collapses, global wars, genocides, and technological disruption on a massive scale. It has not nor will it be displaced by other storytelling forms, such as movies, TV, the internet, and video games. No matter how publishing changes, there will always be a place for novels and those who write them.